Every single vegan has a different story of how they chose their lifestyle. No wonder – there are so many reasons to go vegan! For some – it’s health-related, for some it’s all about ethics, and for others – it’s all about the tasty food. 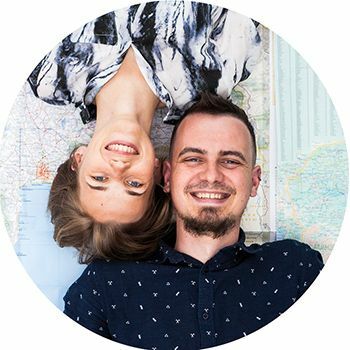 If you have been reading our blog for a while, you probably know that both me and Justinas are passionate about two things – veganism and traveling. Even though traveling can definitely make it difficult to find a nutritious and healthy vegan meal, we both always remained plant-based. The reason for our success is our strong belief and moral system. Today we want to quickly share our story and discuss some of the reasons why more and more people decide to go vegan. Two and a half years ago Justinas was searching for new ways to challenge himself. While browsing different topics, he discovered that there were many discussions questioning whether meat and dairy are beneficial for your health or not. This was when he came upon the 21 days meat-free challenge on a blog post and gave it a shot. For 17 whole days, Justinas didn’t eat meat and felt great. But he had to work for 16 long hours on a wedding photo shoot and failed. Justinas didn’t bring enough snacks and got so hungry and when dinner took place, he did not hesitate and ate steak. But the next day, Justinas tried again – and this time he didn’t fail. After 21 days he formed a new habit and didn’t feel tempted to eat meat again. Not only he realized meat didn’t really taste good to him anymore, Justinas also noticed that even the slightest sniff of certain meat products became repulsing. Also, Justinas felt so good for the three weeks, he decided no food is worth sacrificing that. We met shortly after this and our journey to veganism started together. I always was a healthy gal, and I always cared deeply about the planet. After talking to my friends who own an animal sanctuary, I learned some ugly facts about the meat, egg and dairy industry. I changed my perspective on the matter and naturally adapted the plant-based diet. Justinas sometimes jokes he didn’t really have a choice since I’m the main cook in our relationship – so when I made the change, he had to adapt! Becoming vegan for us was fairly easy even though it took time. Both health and ethical reasons played a big part in deciding to change our lifestyle. But the biggest reason for the change was the Earth and its future. We care deeply about our planet and we knew veganism is worth giving our best effort. I know that there is a lot of information about veganism online, but it can take a lot of time and who has that luxury? So, I made a list of sources about the plant-based lifestyle. Bellow, you will find information about everything from studies about the health benefits of a vegan diet, to some of my favorite blogs about the lifestyle. Did you know that the vegan diet can highly improve your overall health? There are many studies showing a link between the vegan diet and reversing diabetes, preventing heart disease, improving cholesterol levels and fighting even extreme cases of obesity. If you care about your health, you might be worried if you can get all the needed micro and macronutrients from the vegan diet. Worry not -plant-based food has all the nutrients you need to thrive and be at your best health. You might have heard that there are more and more viruses immune to antibiotics. This is partly due to the amount of antibiotics people consume with meat and dairy. Did you know that approximately 80% of antibiotics produced in the U.S. are for animal agriculture? the overuse of antibiotics leads to weakened immunity, digestive problems, allergies, food sensitivities and overgrowth of yeast (Candida) and many other health problems. In 1977, U.S. Senate Committee on Nutrition and Human Needs released a report advising on cutting animal-based products and increasing the consumption of plant-based products to benefit your health. This was based on a study that proved a vegan diet can reverse coronary heart diseases without any other healthy life changes. But because of a backlash from the meat, egg and dairy industry, the report was changed and the Senate committee was disbanded. I recommend you these two books for further reading: “The China Study” and “How Not to Die” . If you want any inspiration how to start a vegan lifestyle and prepare plant-based food visit my favourite blogs created by two outstanding mothers Sarah Lemkus and Ellen Fisher. It conserves water. The amount of water needed to produce one pound of beef is 1,799 gallons of water; one pound of pork takes 576 gallons of water. As a comparison, the water footprint of soybeans is 216 gallons; corn is 108 gallons. Animal agriculture is responsible for 80-90% of all US water consumption. It cuts greenhouse gas emissions. The livestock industry is responsible for 18% of global greenhouse gas emissions. This is more than the entire transport sector, which produces 14% of the emissions. Plant-based diets reduce your greenhouse gas emisions 2.5 times. Animal agriculture creates an incredible amount of waste. Every minute, seven million pounds of excrement are produced by animals raised for food in the USA. A farm with 2500 cows produces the same amount of waste as a city with 411,000 people. Check out the film Cowspiracy to learn about the negative impact that animal agriculture has on our planet. The real war against climate is being fought on our plates, multiple times a day with every food choice we make. One of the biggest challenges facing our planet, and our species is that we are knowingly eating ourselves into extinction, and doing very little about it. – Nil Zacharias, co-founder of One Green Planet. This part of veganism is the most important for some vegans and I have already wrote a post why it’s important to protect animals. The meat, dairy and egg industry is responsible for torturing and killing millions of innocent animals every year. No living creature should ever go through such horrible experiences. Pigs deserve to live just as much as dogs or cats do. These are all animals worthy of life. So why eat one while cuddling another? Just because I’m a vegan I’m not saying you should be a vegan. It would be ironic if I refused to force my will on animals but was forcing my will on humans. So whether you’re going vegan or not, we suggest putting as many plants on your plate as possible at every meal. It’s good for you and it’s good for the planet.